The Scottish Cup final is the showpiece event for the game in Scotland. The atmosphere is normally charged with excitement, and spirits run high. This is not something which would surprise anyone with even a passing acquaintance with football in Scotland. It is therefore all the more incredible that in this end of season spectacle, the Scottish FA and Police Scotland could allow one set of fans to become completely out of control, and to run amok within the stadium. The game itself was a see-saw battle with each side having periods of dominance. At the end of the day Rangers, it must be acknowledged, came up short against a Hiberninan team which looked sharper and more determined on the park. However nothing which occured on the pitch will be remebered as much as the shameful scenes at the final whistle. Video evidence seems to leave little doubt that a number of Rangers' players and staff were assaulted by Hibernian supporters within the field of play. 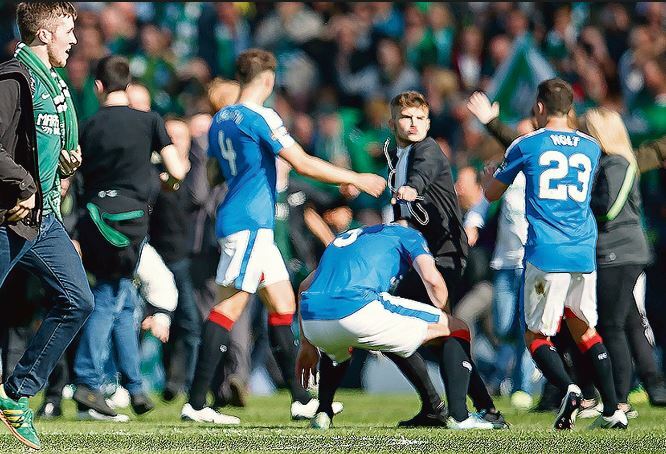 Many of these supporters also seemed hell-bent on storming the Rangers end of the stadium. It was no thanks to the woeful stewarding or indeed the police that these fans did not enter the part of the ground occupied by Rangers fans. With many families with young children in the crowd what was already a terrifying ordeal could have become much worse. It will be interesting to see what action is taken by the SFA and Police Scotland as a result of the violent scenes on Saturday, and I am sure Rangers fans everywhere will be intrigued to see what sanctions are imposed. Unfortunately previous incidents of violence within grounds, including a number this season, seem to have have been downplayed to the point of trivialisation by the SFA, and the historical detection rate by Police Scotland for football offenders is less than impressive. It is a sad situation when here outside Scotland, the main topic of conversation regarding the final is not the excitement of the match, but the sight of mounted police trying to clear the pitch of rampaging supporters.